Closed Circuit Television will provide a good deterrent against crime but will also allow you to monitor an area to enable you to see what's happening in parts of your building when unattended. The quality of CCTV pictures these days is exceptional with good colour daytime pictures and good monochrome night pictures, recordings are made to a DVR digital video recorder hard drive providing easy playback of any scene and excellent quality with multiple pictures. 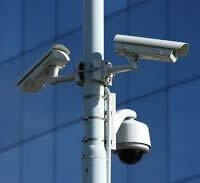 We can install a simple one camera system connected to your home TV up to multi-camera IP web enabled solutions. FSL will dedicate the same amount of attention to planning, designing, integrating, and installing it. Using today's latest state-of-the-art equipment, like digital video recorders (DVR's), Video web servers and I/R day and night cameras, along with our fully trained installation team, we can install a system that not only looks smart, but performs superbly. All the cameras we use are able to produce extremely high quality colour imagery during the day and excellent black and white images at night, even in pitch black. 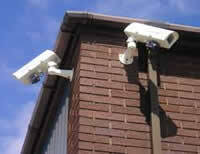 This is why we're confident of delivering the best CCTV solution whatever your requirements. Call us to arrange a survey and quotation.